Sector coupling is an increasingly popular term used to describe an already well known fact. The switch from fossil fuels to renewable energies does not stop at the electricity sector. Heating, cooling and transport are other areas in which fossil fuels are to be gradually replaced with renewables. This can be achieved either by using renewables directly – for instance, by using solar thermal collectors to heat a house, or by using renewables-generated electricity in other sectors. This transfer of clean electricity into other sectors, where it is used to reduce the amount of fossil energy required, is referred to as “sector coupling”. 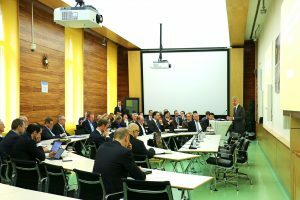 On the occasion of the WEC Austria Workshop on March 28th, 2019 several speakers discussed the importance of sector coupling for energy transition, what is currently being implemented and what still needs to be done.